The closest known exoplanet is currently called Alpha Centauri Bb, but the folks behind Uwingu want you to come up with a cooler name. "It might be Pandora. Who knows?" said planetary scientist Alan Stern, Uwingu's co-founder and chief executive officer. 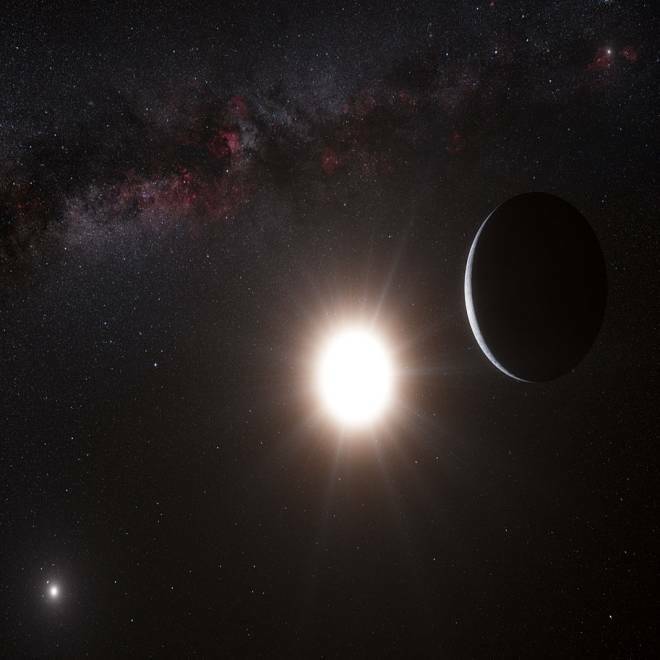 The International Astronomical Union, which usually takes the lead role in naming celestial objects and features, has held back on creating an exoplanet-naming process. So Stern and his partners set up Uwingu to fill the vacuum — and raise some funds for research and education in the process. Starting today, Uwingu is taking nominations for Alpha Centauri Bb's new name, at a price of $4.99 per suggestion. For 99 cents per vote, Uwingu's registered users can pick their favorite name. The name that has the most votes when the contest ends on April 15 will be crowned the people's choice. It won't carry any weight with the IAU, but Stern is hoping that the name will stick. "There are people in the world who think astronomers own the sky, and what we're effectively saying is, it's the people who own the sky," Stern said. The user who suggests the winning name will receive recognition and prizes from Uwingu. There'll be additional yet-to-be-specified prizes for runner-ups, and for those whose name suggestions reach the 100-, 1,000- and 10,000-vote level. Uwingu already has a list to start with, since it's been in the exoplanet-naming business for several months. Proceeds from the contest will be distributed according to Uwingu's formula, which puts half of the money into a fund to be given out as grants. Uwingu is structured as a commercial venture, so the rest of the money helps pay the venture's bills. Stern realizes that having people pay to suggest planetary names with no official standing may be controversial, and he's willing to take the heat. "Just spell our name right," he said. His supporters include one of the world's foremost planet-hunters, Berkeley astronomer Geoff Marcy, who is one of Uwingu's advisers. In an email, Marcy told NBC News he thought the idea of naming Alpha Centauri Bb sounded "marvelous." "It should be fun and creative," Marcy said. "It hurts no one, and generates funding for research. What a perfect antidote to the modern crunch on funding in pure research!" Uwingu's critics include Caltech astronomer Wladimir Lyra, who came up with his own proposal for naming extrasolar planets a few years ago. He's not crazy about the pay-for-play naming system. "What I would advocate is a classical way of naming the planets from our own myths, the way we name features on planets in our own solar system," Lyra told NBC News. "We can draw upon the expertise that the IAU has for naming things." As long as people understand what they're buying — and what's not for sale — Uwingu's contest looks like an interesting and harmless experiment. Heck, it might even push the world's astronomers to reach consensus on names for the most prominent exoplanets. But what do you think? Feel free to weigh in with your comments below. Update for 9:35 p.m. ET: I originally wrote that Uwingu is structured as a for-profit venture, and that the company's partners will receive some of the proceeds — but in a follow-up exchange, Stern said that Uwingu is a long way from making a profit. Half of the revenue goes to a fund for research and education grants, and the other half helps pay the bills. "Uwingu was to find a new way to fund space research and education in tough times. Some of us wrote checks and put some pretty serious money into getting the company started, and each of the members of this company has contributed hundreds and in some cases thousands of hours to developing this since 2010," Stern said in an email. "None of us has received even a dime from the Indiegogo campaign or any funds we've earned on sales since we debuted. This is a labor of love." Mission to Alpha Centauri by 2011?